Firstly, for inspiration I looked up existing special collections blogs in universities around Ireland and the UK. I also snooped through other library and non-library blogs, trying not to get too engrossed or go off topic during working hours. I noted the design, content, regularity and variety of posts and contributors, writing style and other interesting or unique features. For instance the RCSI Heritage Blog has an impressive informal writing style, excellent imagery and interesting topics. LibFocus was invaluable in its variety of posts and insights into blogging in general. 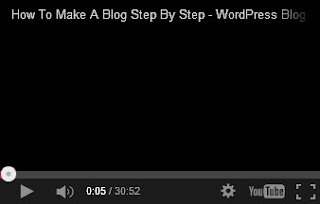 I discovered there are many different blogging platforms, and with free online social media courses one can easily jump right in and get started. However, as this is a team effort and to sneak in a CPD opportunity, I thought some specific face-to-face training would be in order. With the support of management, my special collections colleagues and I received a half day training session with the wonderful Jane Burns. Jane, an information specialist and social media wizard, offered a tailor made training session on the ins and outs of blogging. Her professional approach began with a pre-training day task encouraging us to look differently at our collection: in 200 words what item would we save from Special Collections if, touch wood, there was a fire? Writing a personal reflection like this helped to introduce the ‘personal perceptive’ concept of blog writing. The language had to appeal to everyone but be familiar to our library colleagues. Jane explained the different blogging platforms and we decided our best fit was WordPress. For the beginner, it is easy to use, extremely adaptable and has a pleasant interface. The design of our blog would provide a fleeting permanence, be dynamic and changeable. 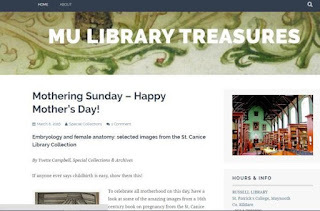 We brainstormed a number of possible names and settled on MU Library Treasures which we felt encompassed our collections and what the blog is about. To ensure our ‘dynamic and changing’ interface we incorporated rotating header images as part of our design. We included the opening hours for both locations, uploaded a gallery of images depicting a taste of our collections and embedded our social media links and visitor statistics. WordPress offers a great statistical recording element to the administration aspect of the blog. It provides insights into popularity of posts, where our readers are from and the breakdown of comments. The team agreed on a target of posts with the intention of regularity but not to overwhelm either ourselves or our readers. We created a Google calendar which we fill with upcoming University, local and national events. This helps to inspire and allows us to a ‘bank’ and schedule posts. Each team member is encouraged to contribute and the blog is opened to guest contributors. A picture can say a thousand words and when restricted to 500-800 words the right image can enhance a post. The concern however is copyright. Some of our collections include un-catalogued material that has strict conditions in their loan, donation or bequest agreement. In the blog ‘about’ page we include a disclosure that states ‘unless otherwise noted all images are copyright of Maynooth University Library’. Any external images used are referenced and obtained through appropriate channels such as Creative Commons. Overall, the hard work was worth it. I gained a wealth of experience in the technological aspect of library work. I think the training was an essential element to the task. I now feel confident in setting up a blog, writing for one and encouraging others to do so. The reward of publishing a small piece and exposing interesting features of my work to a wider audience outweighs any hick-ups encountered in blogging. I gain a deeper appreciation for our collections and who knows, may even encourage a budding researcher to come in and have a look.